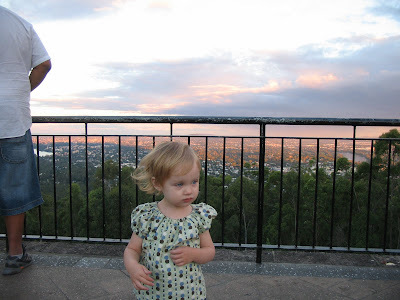 This is the impressive view from the top of Mt Coot-tha, at sunset on Anzac day. 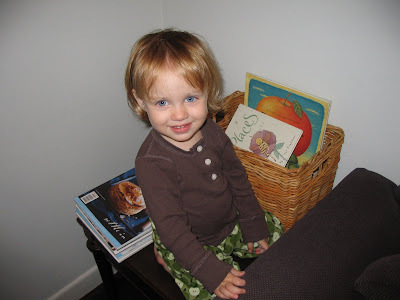 Just a pic of Evie looking pretty happy with herself, sitting on a side table with her basket of books :) Enjoy! This is our clothesline full of cloth nappies in the late afternoon sun. 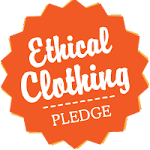 We've been using cloth since Evie was born, and we're really happy with the savings we've made, the environmental benefits, and the most important factor- no yucky chemicals being absorbed by Evie's skin. We have a range of different brands and styles of nappies, at the moment we're mostly using all in ones (good for wriggley toddlers), which are nappies that have a cover built into them. Most of the nappies in the picture are made by the Itti Bitti Nappy Co, but there's also a Tots Bots Bamboozle in there (the yellow one) and as the name suggests, is made from Bamboo fibres. The Itti Bittis are made with either hemp or bamboo absorption layer, with a microfleece liner, and a minkee or PUL outer. We also use Bubblebubs, Swaddlebees, and Baby Beehinds bamboo nappies. It certainly feels good not to have to put a packet of disposable nappies in our trolley every week, they must be very expensive as you can tell when they're on sale- there will be trolleys full of packets or boxes of the things! Sadly, 90% of families use them in Australia though, and that creates enough landfill to fill the MCG 3 times over, every year. 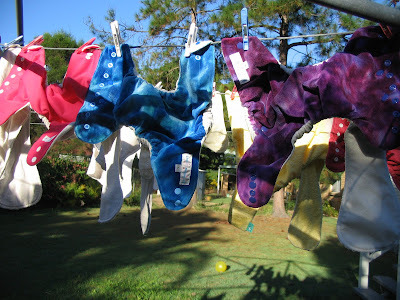 Every disposable nappy uses 1 whole cup of crude oil in it's manufacture, and takes up to 500 years to break down. Yuck! I was ready to catch a bus home after "Babies, books and rhymes" at the library this morning, when I caught a glimpse of Evie in a reflection in a window (she was in a Beco carrier on my back). She was holding something, but I hadn't given her anything. 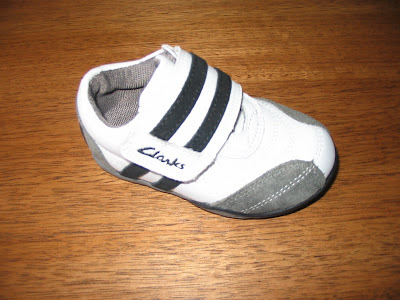 I eventually got her to hand it to me and it was a little shoe- complete with a Myer sticker on the sole. She had just pinched it from Myer, and we made it out the door with no-one knowing! I didn't have time to take it back, but I will when I get the chance. This second (rather dark) photo is of fresh hemp sheets just put on our bed. I love hemp sheets, and I'm testing them out to see how long they last. We've had organic cotton ones in the past, but still managed to put a toe through them after only a couple of years, so thought we'd try hemp. Well, 55% hemp, 45% organic cotton, for a bit of extra softness. They are quite thick, but will soften with age. 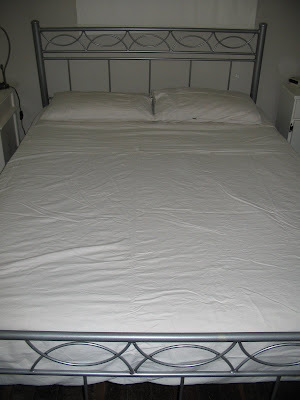 Hemp sheets are environmentally sustainable as they are said to last a very long time due to strong fibres, hemp requires very little water and no pesticides to grow, and the ones we bought were packaged in a cardboard box, with absolutely no plastic. I've had a bit of a forced blogging break due to technical difficulties with our card reader- can't blog without pictures...and Mum's visiting at the moment, so it's a little busier around here. 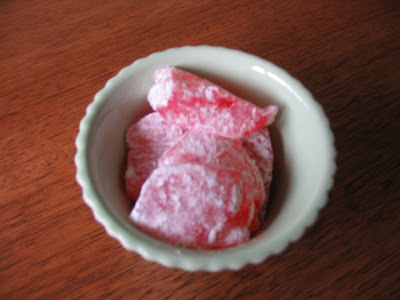 Andrew wanted me to blog about his Turkish delight- he made it himself! And it's rather delicious, not bad for a first attempt. I can see many more batches being made in various flavours. I thought I'd also share a photo of some of the softies I've made over the last year. 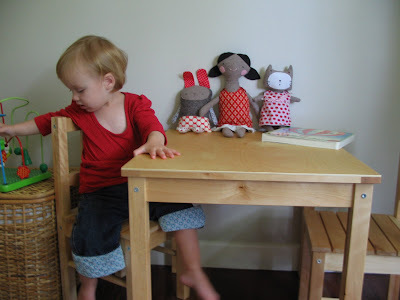 From left to right is a Moopy (like a rabbit) designed by Nest studio, a dolly inspired by Hop Skip Jump toys (they always sell out within seconds of being listed on Etsy, so I don't have much chance of buying one!) and a "Little Kitty" designed by Melly and Me. I've made 8 Little Kitties so far, the pattern is really easy for such cute results. There's still a fair bit of work in them though. I just like picking out fabrics to make their little dresses in :) Oh, and I guess I made that little softie on the left, her name is Evie and I like to dress her too! 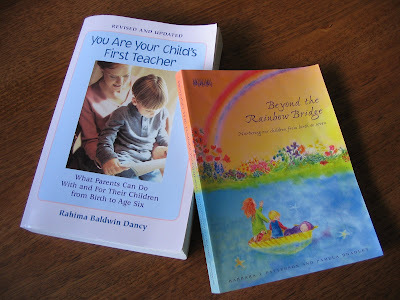 I read 'Beyond the Rainbow Bridge' over Christmas, and have just finished 'You are your child's first teacher', and I'm so glad I did. I'm not a fan of parenting manuals, but these ones make sense to me, and fit in well with my personal philosophies. They have helped me to understand Waldorf philosophies on home life and education for the child, what the child really needs, rather than what society tells us the child needs. It worries me that children are being pushed into academics at younger and younger ages, being taught to read and write before they are developmentally ready, like it's some race. There's no evidence to show that this benefits the child, but there is evidence quite the contrary to show that it can be detrimental to their education down the track. While it is possible to teach these things to small children, it doesn't mean that we should. Waldorf philosophy states that we need to wait until the intense period of bodily growth is completed (at the change of teeth, around age 7) until concepts are taught. In the meantime, we need to let them play, watch us go about our daily tasks, and imitate what they see in the world around them, which helps them to process it in their minds. The world is a new place for them, their is so much to absorb, we don't need to be overstimulating them. They are children for such a short time, and adults for (hopefully) a very long time, there's no hurry to grow up! So I highly recommend these books to any new parents or grandparents, they are definitely books I will keep coming back to.